Not interested in "Legends" (St. Luke's icon that can't be proven), I am interested in the first iconography that was used & venerated by the Christians - that can be proven. Also, I am not interested in Christian art, such as the fish which was not venerated, or wax sealers. I'm interested in when they were implemented into the Liturgy and worship practice (veneration) of the Eastern Orthodox church. The matter is not about what was early or late in history. But rather what is true in the light of the church. There is no proof of icons besides tradition that dates back before the third century. But take the bible in this sense and it will not stands for long, small and very early manuscripts can´t prove the bible to be uncorrupt, but the church can. Living under persecution for 300 years and under the circumstances they had didn´t make icon first priority to safeguard the truth. But the truth didn´t exclude iconography just because it didn´t exist 20 minutes after the crucifixion. The question should be one whether it´s true or not, not on dates and proofs. The trinity is really a truth, but didn´t take that explicit expression until 325. Same goes with iconography. If every icon on earth would disappear until year 2100, it wouldn´t make it false in year 3000 when some dude discovered some old icons. Please forgive me dear brother/sister if i was negative in any way. Been working all day long so please forgive my attitude. Forgive and pray for me. The phrase "trinity" was coined post 325, but the understanding of the trinity existed. So basically my questions are "I just want proof of very early iconography and veneration". You answer is "That should not matter because the church says so". The question exists because iconography usage is absolutely a huge role in EO worship. If this was Christ, there was no text. More importantly, this was 200 years after the resurrection. Very long time after the time of Christ to consider iconography as part of the original Christian church. I know I've given my thoughts on this before, so I tried to do a search for what I had previously written, so as to quote it. I couldn't locate it, however, in the midst of the two dozen or more times you've brought this subject up. Which got me to thinking... perhaps you could go back and look at the hundreds(!) of answers people have previously given you regarding icons? Sometimes I think every believer needs to sketch themselves 2 huge cherubim angels, go to the goldsmith, make them in a large size. Put them on their dinner table and say out loud 100 times every day that God accepted this during old testament laws. Everyone would come to accept iconography and not reject it. It is only when we take the issue of the 2 cherubims on the ark easy, that focus actually disappears from the topic. The earliest particular reference to icons that I recall are in the writings of the mid 4th century Church historian Eusebius. He was personally ambivalent about them in private homes, but the manner of his discussion suggests they were well established if not as widely used as they later came to be in the Church. He also mentions the image reputed to have been made by Christ himself and kept in the city of Edessa. The image of the Holy Mandylion, is based upon the image Christ made on the cloth and sent to the king of Edessa. Some have suggested that the image as it currently exists was modeled more directly on the image placed upon the door of the chest/box in which the cloth image was kept. The icons of the Saints derive from Palastinian and Egyptian funerary tradition. It was the custom to make a portrait of the deceased and attach to the body, and then placed as a kind of grave marker at the crypt where the body was buried. There was a mystical connection that was believed to exist between the image and the deceased person. When the body had decomposed, the bones were gathered and placed in a ossuary and the image went with the bones. As Christians from the region died both of natural causes and of martyrdom, their images were gathered with their bones as well. But for martyrs, their bones were brought back into the temples for the veneration of the faithful, and so did their images which were mounted over or near their holy relics. The idea of a connection between the prototype and the image remained and was refined within the context of Orthodox anthropology and theology with respect to liturgical practice. In short enough time visitors would copy the images of saints found in the temples of the place of their martyrdom and take them back to their temples and so the iconographic tradition of the images of the saints was born. This particular phase was historically quite important for in it are found a number of the theological arguments for them which were used and refined by later generations. If you examine such icons of master iconographers closely, one can see how much of the early Egyptian influence still remains, both materially, and in the geometries of the division of space in the plane of the icon. It has long been argued that Orthodox icons are the material and imagistic heirs of the hieroglyphs of the ancient Egyptians…that as icons they are in fact a species of hieroglyph. With respect to image of Christ and others the interim phase of the 2nd century was marked by coded symbols sometimes drawn from/evocative of Greek mythology. For example, the later icon of Christ Enthroned borrows the seated posture of Zeus as sculpted in one of the major pagan temples of the time). Occasionally one also sees Apollos-like figures that are meant to point to Christ. These are not icons, but they are moving in that direction in that they served metaphorical roles for the faithful. This is the era of the fish symbol and the anchor and all that, but it was also the time of two particular and widespread anthropomorphic figures, one was called the "Orans" the worshiper. It is the figure of a woman with her arms uplifted in prayer. This is the image retained and symbolically enlarges as the icon we see in the apse of most Orthodox temples, the Theotokos with arms upraised and Christ appearing as a child in a mandorla from her bosom. This represents the moment of the incarnation where Christ took on human form in Mary's womb. The second image is that of the good shepherd where in one sees a man with a flock gathered about him, or a man bearing a sheep upon his shoulders. This of course references Christ. What seems pretty certain from the record is that the use of the Cross as a venerable symbol of Christ and the faith happened pretty early…early enough to become a universal Christian symbol from the Mar Thoma Christians of India to the first Breton Churches in what is now Southern England. The other images, of Christ and the Theotokos, and the saints while present from very early days began and remained as a number of what were initially local/regional traditions (like certain feast days) that later gained acceptance throughout the rest of the Church. As for the use of icons prominently in Church architecture, that was beginning around the time of Eusebius and was well underway by the time of St. John Chrysostom. What happened was that the edict of toleration removed most to the threat associated with becoming a Christian…and indeed it became fashionable to become a Christian, and to baptize one's children, etc. So fairly soon…less than a generation after the edict we had temples filled with not only Christians in good standing, but inquirers, catechumens, and lapsed Christians at every stage of repentance…we even had just the idly curious. 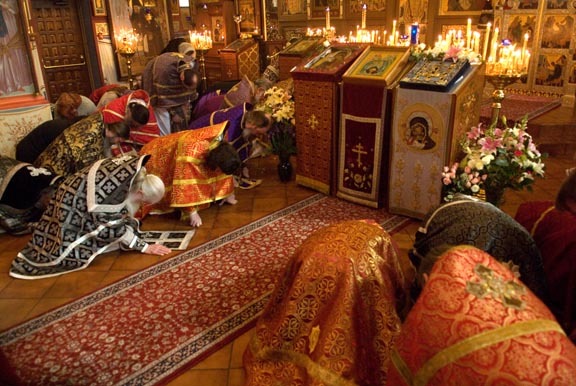 And since the end of the persecutions it had become more and more common for the Liturgy of the Word and the Divine Liturgy to be held one after the other at the same place with the same people in attendance. Prior, when the Deacon has called out "The Doors, the Doors" the only ones left were baptized Christians in good standing. Essentially everyone there communed in the altar (or what would formally become the altar architecturally). That was not possible in the services with crowds in attendance, which meant unworthy eyes were left to gaze upon Holy Things originally belonging only to the knowledge of the faithful. (Holy Things for the Holy). So in order to assist the deaconate in guarding the altar, and still communicate the Holy mystery in ways permissible to the uninitiated, the guard rail of the altar grew into a framework which supported a curtain that could be drawn and pulled back at appropriate places in the service. In Palestinian lands the embroidery on these early on became very detailed, and often iconographic. In Greek Churches this curtain is still preserved above the Holy Doors, but the rest of the framework became a lattice, and then later a wall (by 15th century Russia). Upon this lattice/wall images of Christ, the Theotokos, the Forerunner, Archangels or Sainted Deacons, and the icon of the namesake of the temple were placed. Then were added ranks of feast days, then ranks of prophets and apostles, and so on until the iconostas we know today came into existence. In western Europe the frame (Roodscreen) never became an iconostasis and retained the function of bearing a curtain. This curtain was generally done away with by the 16th or 17th century under the influence of emerging Protestant sensibilities. Again, Orthodoxy claims to be original, yet iconography, a huge part of Orthodoxy, was not original Christianity. I'm simply asking for a good 1st century icon & writings about them. Thank you for at least giving a mature thought out answer. Lacks examples, but thank you. I do find it interesting that you are admitting that Christ took the place/poster of Zues, and other Greek art. God told them EXACTLY how to make the ark of the covenant. I'm still looking for egg tempera and halos (Eastern Mysticism). You've never heard of the catacombs? This is getting embarrassing now. You've been told so many times and you still claim to have never gotten an answer. Lol. He does regurgitate these "questions" like it's nothing, and never actually considers the responses (see how he ignored Cyrllic's post) unless he thinks they confirm his current convictions (see how he responded to Seraphim98's post). He's just looking for an argument, it honestly seems. Biro, you did not read the thread at all. It has been mentioned and discussed. I didn't ignore it, I thought it was already discussed. I want to see an icon from the 1st century or writings about them in the 1st century, or at least VERY early 2nd century. Obviously many texts survive, but nothing about icons. Seraphim98's post mostly had reasons to flee from iconography, and also not citing his sources. Such as "crosses were venerable". Don't believe that length fully states point. I asked for simple proof. Where is it? Venerated icons, or writings about venerated icons in the 1st century. Just because it's not on the internet doesn't mean it's not true. There may well be examples of icons from the first century, I don't know one way or another. But even if there weren't any, I wouldn't think too much of it. Given that they were too busy living and propagating a faith that was quickly deemed illegal and punishable by persecution and death, I wouldn't expect very many of them to take the time to paint pretty pictures. Heck, I'm glad they left us with the New Testament, can you imagine if we only had the OT to work from? We could still preach the gospel with only the OT, but how much more difficult would it be? The Cross did become a symbol of Christianity early on. St Thomas is said to have carved one in stone while in India, and it was this Cross which he held on to as he was dying. If I'm not mistaken, it still exists, and has been known to perform miracles (meaning both that people who pray before and venerate it have received miracles from God through the Apostle's intercession and that wonders have been exhibited by the Cross, such as the miraculous flowing of blood, which happened on the anniversary of his death every year until the 1700's). The style of Cross he carved has become the prototype for most traditional Indian crosses. Seraphim, where can I read more about the relation of iconography to Palestian/Egyptian funerary tradition? I've never heard of that before, but it was quite fascinating. Agree completely about the internet. I'm willing to travel. So the cross performed miracles means that people venerated it? You ask for proof like an atheist. I'm sorry it must seem that way, but this involves Christianity in the context of historical proof within a church claiming originality. You mean in front of an icon? Kind of circular. I'm actually looking for clear cut sources. Look if I'm wrong, I'm wrong... I can accept that. But I can't accept icons as original until I see something. If I ever rejoin the EO church, I must have clarification on things. I can't just "venerate", and go on, when I feel it is sinful. I really hope you see my cause of concern here. Simply look at that photo & READ THE COMMANDMENT. Icons in ornate served settings, being bowed to by clergy like that... The likenesses of things in heaven. No proof in the 1st century, and very little proof of icons until the 4-5th century. Do you really think your tired iconoclastic arguments were not brought up by your predecessors and refuted? Anyway, have fun reassuring yourself.